We describe a case of a 19 year old man who developed traumatic pulmonary pseudocysts after a roll-over road traffic crash. These were associated with significant pulmonary haemorrhage requiring a period of mechanical ventilation, but resolved without specific intervention. Review of the literature confirms that this rare complication of blunt chest trauma occurs usually in young adults and, although normally benign, can be associated with life-threatening haemoptysis and secondary infection. The strict pathophysiological definition of traumatic pulmonary contusion is exudation of fluid and blood into the lung parenchyma without substantial tissue disruption. Rarely, chest trauma can cause pulmonary pseudocysts: air, fluid, or blood filled, well defined spaces not lined with epithelium. This complication of blunt chest trauma has been described previously in a few case reports and case series, but mainly in surgical1-7 and radiological8-12 journals. We describe the occurrence of traumatic pulmonary pseudocysts in a young man. A 19 year old man was admitted to hospital after a road traffic crash: he was the driver of a car, which overturned at 60 mph. He lost consciousness for approximately 1 minute. On arrival in the emergency department his airway was clear. His oxygen saturation by pulse oximetry (SpO2) was 100% while breathing 15 litres of oxygen; he had a respiratory rate of 24 per minute, the trachea was central, and on auscultation he had breaths sounds equally on both sides but with some scattered coarse crackles; he had some haemoptysis but did not complain of chest pain. His heart rate was 100 and blood pressure was 130/90. His GCS was 14. He was agitated. Initial examination of the abdomen was normal. 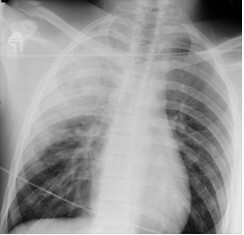 Chest radiograph revealed infiltrates in the upper zone of the right lung, fluid in the horizontal fissure and fracture of the right clavicle (Figure 1). He was very aggressive and agitated so he was sedated and intubated before transfer to the computed tomography (CT) scan room. CT scans of the brain and spine were normal but the chest CT showed extensive consolidation in right upper lobe with air bronchograms and marked cavitation (Figure 2). There was also patchy consolidation of right and left lower lobe, possibly due to aspiration, and a small pneumothorax on the right. He was admitted to the intensive care unit (ICU) for ventilation with a diagnosis of pulmonary contusion and aspiration. Over the next 48 hours, he had several episodes of frank bleeding through the tracheal tube, mostly when the sedation was reduced for neurological assessment and possible extubation. We were concerned that the cavities in the upper zone of the right lung, combined with significant haemoptysis, might represent active tuberculous (TB). Thorough questioning of the patient’s parents ruled out any obvious risk factors for TB; he was a perfectly healthy young man. Sputum was sent for acid fast bacilli and microbial culture and sensitivity; nothing of significance was identified or grown from these samples. On day 3, a repeat chest CT was similar to the previous CT; however, the right upper lobe consolidations with air filled cavities were considered to be consistent with traumatic pulmonary pseudocysts and intrapulmonary haemorrhage. The patient was finally extubated on day 4 and maintained adequate oxygenation with 60% high flow oxygen by facemask. His oxygen requirements reduced rapidly over the next two days and he was able to mobilise without being breathless. On day 8 he was discharged from ICU. 1. Melloni G, Cremona G, Ciriaco P, et al. Diagnosis and treatment of traumatic pulmonary pseudocysts. J Trauma 2003; 54: 737-43. 2. Athanassiadi K, Gerazounis M, Kalantzi N, Kazakidis P, Fakou A, Kourousis D. Primary traumatic pulmonary pseudocysts: a rare entity. Eur J Cardiothorac Surg 2003; 23: 43-5. 3. Stathpoulos G, Chrysikopoulou E, Kalogeromitros A, et al. Bilateral traumatic pseudocysts: case report and literature review. J Trauma 2002; 53: 993-6. 4. Moore FA, Moore EE, Haenel JB, Waring BJ, Parsons PE. Post-traumatic pulmonary pseudocyst in the adult: pathophysiology, recognition, and selective management. J Trauma 1989; 29: 1380-5. 5. Kato R, Horonouchi H, Maenaka Y. Traumatic pulmonary pseudocyst: report of 12 cases. J Thorac Cardiovasc Surg 1989; 97: 309-12. 7. Blane CE, White SJ, Wesley JR et al. Immediate traumatic pulmonary pseudocysts formation in children. Surgery 1981; 90: 872-5. 8. Robin J, White R. Formation and resolution of bilateral traumatic pulmonary pseudocysts. Australas Radiol 1995; 39: 292-5. 9. Sorsdahi OA, Powell JW. Cavitary pulmonary lesions following non-penetrating chest trauma in children. Am J Roentgenol 1965; 95:118-24. 10. Fagan CJ. Traumatic Lung Cyst. Am J Roentgenol 1966; 97: 186. 11. Willams JR, BonteFJ. Pulmonary damage in non-penetrating chest injuries. Radiol Clin North Am 1963; 1: 439. 12. Fagan CJ, Swischuk LE. 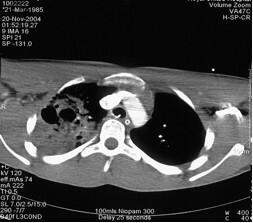 Traumatic Lung and paramediastinal pneumatoceles. Diag Radiol 1976; 120: 11-8. 13. Shirakusa T, Araki Y, Tsutsui M, et al. Traumatic Lung Pseudocyst. Thorax 1987; 42: 516-9. 14. Stultz P, Schmitt HE. Hasswe J, Gardel E. Traumatic pulmonary pseudocysts and paramediastinal air cyst. Two rare complications of blunt chest trauma. J Trauma 1984; 24: 850-3. 15. Gincherman Y, Luketich JD, Kaiser LR. Successful nonoperative management of secondarily infected pulmonary pseudocyst: case report. J Trauma 1995; 38: 960-3. 16. Caroll K, Cheeseman SH, Fink MP, Umali CB, Cohen IT. Secondary infection of post-traumatic pulmonary cavitary lesions in adolesecents and young adults: role of computed tomography and operative debridement and drainage. J Trauma 1989; 29: 109-12. Figure 1. Initial chest radiograph showing infiltrates in the right upper zone; cystic changes are just visible. There is a fracture of the right clavicle. Figure 2. Computed tomography of the chest. Two large cysts are surrounded by several smaller cysts. All pages copyright ©Priory Lodge Education Ltd 1994-2006.